Diamonds are precious and rare, sparkling with brilliant light that dazzles and captivates the imagination – and the heart. Whitakers has been working with the most stunning of diamonds for more than a century and our knowledge and passion for these beautiful stones runs deep. Every diamond is special, but they are not all created equal. At Whitakers we know the magnificence and beauty of a diamond begins deep in the earth as it forms – but it’s also how well a diamond is crafted once it’s out of the ground. The Four Cs of diamond selection – Colour, Clarity, Cut and Carat Weight – is the globally accepted standard for describing diamonds and the universal method for assessing the quality of any diamond anywhere in the world. An understanding of the Four Cs of diamond selection helps you understand everything about your diamond and its unique characteristics. Of the Four Cs, by far the most important is the cut, because this is what brings all the brilliance and magnificence of your stone to life and lets it shine at its very best. It’s the Whitakers tradition to work with only the best diamond cutters to ensure our diamonds are intense, spectacular and unforgettable. The innate beauty of a diamond begins with how well it interacts with light – and that comes from the precision of its cut. A perfect cut requires experienced and precise workmanship so it can be shaped with perfect symmetry and proportion to give it fire and optimise its sparkle. It’s the quality of the cut that maximises a diamond’s value, and it’s important to remember that even a high-grade diamond can appear dull and lifeless without a high-grade cut. When diamonds are cut with the correct proportions, light is returned through the top (or table) of the diamond. If the cut is too shallow, light leaks out the bottom; and if it is too deep, the light escapes from the sides. Like anything natural, slight variations will always occur. Most diamonds have some tint or colouring, and the closer to ‘colourless’ a diamond is, the rarer and more valuable it is. According to the GIA, a chemically pure and structurally perfect diamond has no hue, and appears like a drop of pure water. While many diamond colour distinctions are so subtle they are invisible to the untrained eye, they still have a big impact on a diamond’s quality and price. The GIA classifies a diamond with a letter grade from D to Z by comparing a diamond to master stones representing the colour grades on the GIA scale. Typically, Whitakers uses diamonds that fall within the ‘Near Colourless’ to ‘Colourless’ ranges. Formed deep within the earth, diamonds are made from carbon that has been exposed to enormous heat and pressure over millions of years. 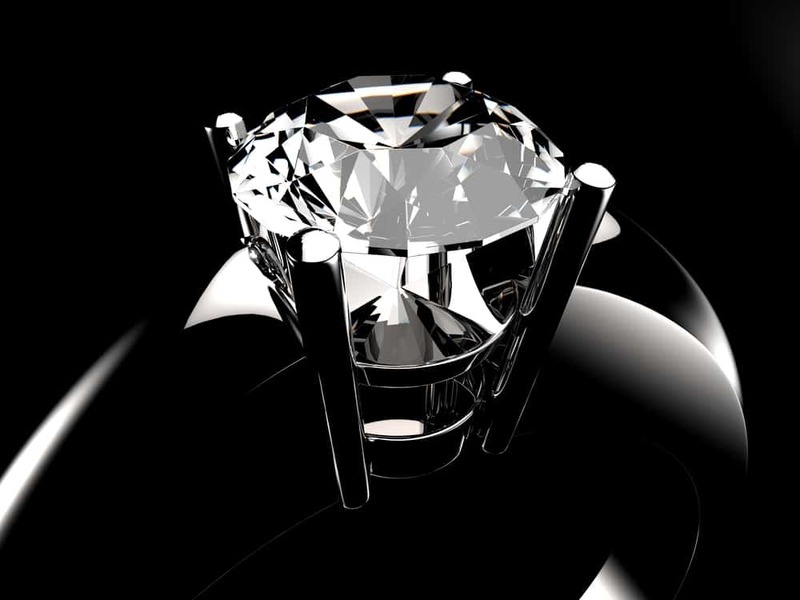 This natural process exposes diamonds to a number of characteristics that affect their clarity. Internal characteristics are called ‘inclusions’ and external characteristics are called ‘blemishes’. A diamond’s clarity is the measure of its purity. Stones are graded by the visibility of its inclusions and blemishes under magnification. It involves identifying the number, size, relief, nature and position of these characteristics and how these affect the overall appearance of the stone. It’s rare for a diamond to be perfectly pure, but the closer it comes, the higher its value. The GIA Diamond Clarity Scale has six categories which form a total of 11 specific grades. The carat weight of diamonds is the measurement of how much a stone weighs – not how big it is. A metric carat is one-fifth of a gram (200 milligrams). Each carat is divided into 100 points and it’s this that allows the very precise measurement that enables an expert to determine a diamond’s exact size. A diamond weighing less than a carat is often described by its points alone – for example, a diamond weighing 0.4 carats might be referred to as a ‘forty pointer’. A diamond’s value is determined using the Four Cs, not just carat weight. However, you can expect a diamond’s price to increase with its carat weight because larger diamonds are rare and usually more sought after. At the same time, two diamonds of equal weight can have very different values and prices depending on their cut, clarity and colour. Some weights are considered ‘magic sizes’. These include half-carat, three-quarter carat and one carat. When you are buying, it’s a good tip to keep in mind that the visual difference between a .99 carat and a carat will be unnoticeable, but the price difference will!